In the mid 1800s, nearly a quarter of a million immigrants from Ireland came to America to escape the Irish Potato Famine . As luck would have it, they also brought what later became one of most honored traditions in America. Jack-O-Lanterns originally were carved from a turnip, gourd, potato or beet. They were then lit with a candle or a burning lump of coal. These lanterns represented the souls of those who had gone before. The Irish believed that the lanterns protected them from any evil spirits that may have been hanging out and about. Here in America Turnips or gourds were not such a hot commodity, but pumpkins were . So the Pumpkin became the de facto Jack O Lantern as well as famous around the world as the symbol of Halloween. Who doesn’t love Halloween? All those cute kids, creative costumes, candy, and spook allys. And the pumpkins, oh… those adorable pumpkins. They seem to be everywhere! There seems to be a gazillion things to with a pumpkin. There is even a rock band named The Smashing Pumpkins. 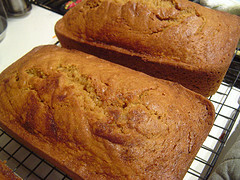 However, my favorite use for a pumpkin is to bake a delicious loaf of soft and savory pumpkin bread. Try my delicious pumpkin bread made with heart healthy olive oil and you are sure to enjoy a delicious Halloween. Not to mention …., there will be no evil spirits in your kitchen!!! 1. Preheat oven to 350 degrees F (175 degrees C). Spray three 7×3 inch loaf pans bread pans with olive oil cooking spray. 2. In a large bowl, mix together pumpkin puree; eggs, olive oil, molasses, vanilla water and sugar and brown sugar. until well blended. In a separate bowl, whisk together the flour, baking soda, salt, cinnamon, nutmeg, cloves and ginger. Stir the dry ingredients into the pumpkin mixture until just blended. Pour into the prepared pans.